If I found myself on that mysterious island that only permits survivors one thing, I would probably have to bring this book. Some people fall back on well work copies of Jane Eyre or Pride and Prejudice--I return to the dreams of Sara Crewe. This book brought me through some incredibly dark times as a child. As a little girl, I dreamed so often of being a princess, beloved by all the world. I was perhaps dreadfully spoiled; but either way, the age when I learned that I was only one of a million other princesses was surprisingly hard on me. It took me a while to understand that just because all the other girls were also princesses, that did not make me any less of the wonderful, beautiful girl I had always believed I was. It was a time of shattered self-confidence, feelings of inadequacy, and constant self-consciousness. And in the middle of this battle for my sense of self and constant feeling that the world was infinitely against me, I constantly ran back to "A Little Princess." Sweet, charming, brave, determined little Princess Sara was a constant reminder of who I wanted to become. I was raised on her beautiful dresses, fabulous dolls, and multitudes of friends, so I had always held her up as a role model. But once I hit the dreadful pre-teen/teen years, I started learning that I wanted her character as well. Her instinctive kindness, generosity, confidence, patience, strength, and devotion to being forever at her best. These qualities drew me in over and over. In many ways, I still return to my mental picture of her whenever I need some bolstered reminders of who I am trying to become. 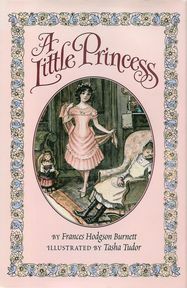 Regardless of my age, "A Little Princess" has never failed to bring to life my dreams and give wings to my imagination. My poor little copy is worn absolutely through; the front cover holding by a corner. Yet, it still means as much to me today as the day I first opened its pages.